The late 1950s was a time of innocence in West Michigan and around the country. Life was simple and hopes were high. The rock music scene was in its infancy and the dreams of teen groups were pinned on the willingness of someone's parents to let their band practice in the garage. Small record labels were producing 45s for radio airplay and local fans to buy. Sharp-looking teen musicians with matching suits and neat haircuts played to huge crowds of teens at local dances on weekends, hoping to be part of the phenomenon sweeping the nation. 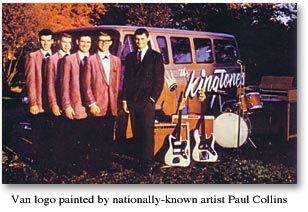 In a garage in Grand Rapids, a group of young men were gathering their high hopes and starting a band, soon to be known throughout the Midwest as The Kingtones. In 1961, The Kingtones hit the charts with "Wish for an Angel" and started a musical legacy that would last half a century. They raced up the charts and found local fame, while struggling to reach outside of Michigan. In the midst of the British Invasion, The Kingtones saw their records passed over in Detroit and Chicago. But through trying times and a rotating line-up, the band stayed together and has stood the test of time while remaining one of West Michigan's most popular acts. The Kingtones retired from playing music after 50 years of service in January of 2008. The members at that time were Bruce Snoap and Phil Roberts, the two original Kingtones: with George Campbell, Jim Lewis and Jay Fortier completing the group's roster. We have added a Facebook page to share memories of The Kingtones at www.facebook.com/KingtonesRockNRoll .